Symphony, the arch rival of Walton, is becoming widely popular and releasing very reasonable Android smartphones and tablets to the public here in Bangladesh. Though these are speculated to be Chinese products which are just ‘re-branded’, it doesn’t matter as long as the products provide great service to the users. Since Symphony has already established itself in the mobile phone market, they are now looking forward to conquer the local tablet market. The first wave of tablets Symphony released were the T7 and T8 versions. Although with very low-end specs, it provided the 3G feature which attracted a large base of customers. The main difference between the T7 and T8 is the screen size, T7 – 7inch and T8 – 8inch. Before selling it in retail stores, Symphony partnered with Grameenphone to sell the tablets in an attractive package. Symphony unveiled their upcoming tablet, T8i. By the name, it is easy to tell that this is just a revamped version of the predecessor, Symphony T8. 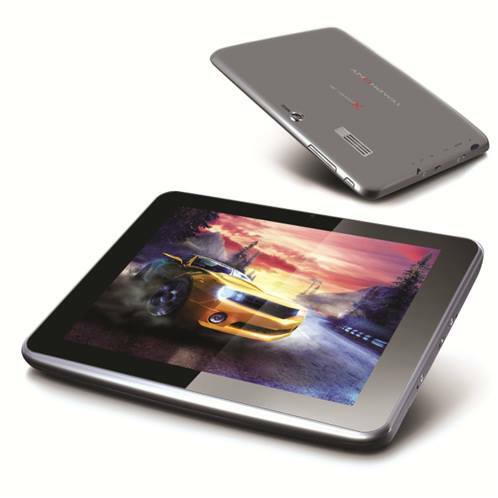 Though it is disappointing to see the tablet running on the late Android 4.0 ICS, it will have the 3G and WiFi data service option which can be one of the reason for the consumers to smile after procuring the product. The tablet has an 8-inch IPS XGA Capacitive Touch screen with a resolution of 1024 x 768 similar to the previous and sports the same dual core processor clocked at 1GHz powered by 1GB of RAM. Around the back, the Symphony T8i has a 5MP Camera with a 2MP one at the front, a notable upgrade from the previous which had a poor 2MP camera. The battery unit has also been upgrade slightly to 4700 mAH enabling the tablet to have a standby time of 600 hours and a talk time of 6 hours, all depending on the network usage. What’s new in Symphony T8i? The price hasn’t been mentioned yet but the previous price tag for Symphony T8 was Tk 12850 so we can speculate the price to be a bit higher. Let us know your thoughts on this upcoming tablet! I am suffering now. I just bought a symphony T8i and after seven days at night it’s totally powered off and no display. I have tried a lot but nothing.What to do I don’t know I don’t know. In the morning I take it to the showroom they say we can’t do anything..go to customer care. I got there and told everything I faced. They really don’t care…told me that new or old they cant replace it; I need to leave it there for servicing. Can you believe just for seven days…I used it..do nothing just surf the net play games..its out..and they told me that..give it for servicing…no replacement..The worst tab is the symphony…Please be careful everybody before buying..don’t waste your money the way I did. SAD TO HEAR THAT. I am also using T8i and its pretty good except for the occasional app crashes and this thing cannot run higher end games like FIFA 15 or Asphalt 8 without app crashes. But it still is a good tablet for 12,000 TK. I SUFFERERED FROM THIS TABLET TWO TIMES WHEN THE SCREEN COMPLETELY FROZE AND I HAD TO WAIT FOR THE POWER TO DROP TO ZERO. BUT BIG CRASHES LIKE THIS ARE OCCASIONAL AND IF YOU DON’T HAVE A TABLET YET AND NEED A BUDGET TABLET I SUGGEST YOU GET ONE OF THIS. I HAVE BEEN USING MY TABLET FOR 5 MONTHS AND IT IS WORKING NICELY EVEN THOUGH IT CRASHES OR FREEZES OCCASIONALY. BUT IT IS STILL GOOD. MY ONLY COMPLAIN IS THE PROBLEM WITH VERY HIGH GRAPHIC GAMES AND OLD ANDROID ICS BUT RATHER THAN THAT ITS NICE AND YOU SHOULD BUY IT. BUT IF YOU PLAN ON PLAYING GAMES LIKE REAL RACING AND FIFA 15 THEN GET A SAMSUNG TAB S OR I PAD FROM OTHER COUNTRIES. BUT I THINK SAMSUNG IS AVAILABLE IN BD. ANYWAYS THIS THING IS VERY GOOD FOR PEOPLE WHO JUST WANT FUN GAMES BUT BAD FOR PEOPLE WHO WANT EXTREME GRAPHICS GAME LIKE FIFA 15 AND ASPHALT 8.